I've been drooling over runway makeup lately; there are so many gorgeous and inventive ideas that use makeup in a dramatic yet modern way. 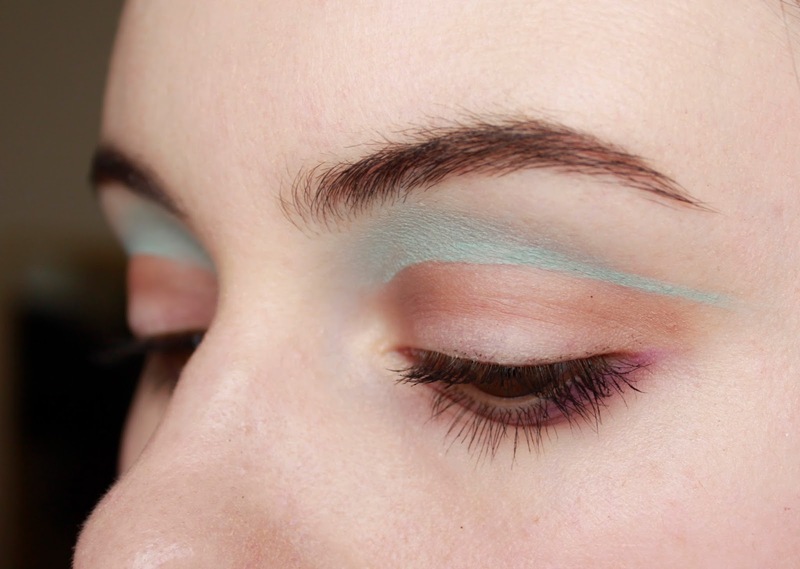 The notion of wearing little makeup aside from a slash of orange pigment along the eye, as Peter Som did, is so refreshing and bold! The inspiration for this particular look came from a two distinct runway looks, combined with my desire to inject a little color into them. First, I saw Gabriele Colangelo's minimal white makeup (top image at left) in my new favorite magazine, In Beauty. 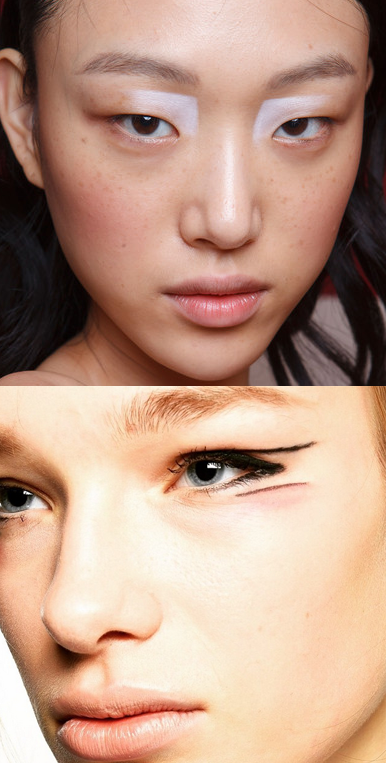 I love the simplicity of this look as well as the way the geometric shape plays with the bone structure of the eye. It's kind of taking a standard makeup "rule" (light colors towards the center of the eye and darker at the outer edges) and exaggerates it. 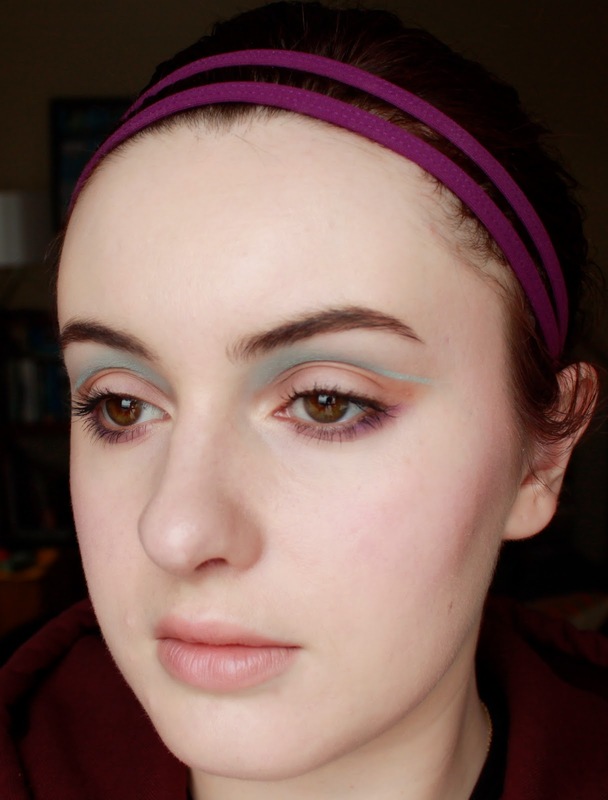 So, I had already planned to do a version of this makeup, thinking I would use MAC's beautiful Paint Pot Clearwater because I've been loving baby blue lately. Then, this morning I saw the bottom image at the left on MAC's Instagram page as a peak into their makeup at Jean-Pierre Braganza's NYFW runway show and, again, wanted to try it out; so I thought, "why choose one or the other? Let's slam 'em together!" In the process, I definitely tweaked a lot of the properties of each look, but just wanted to show you what I started out thinking about! 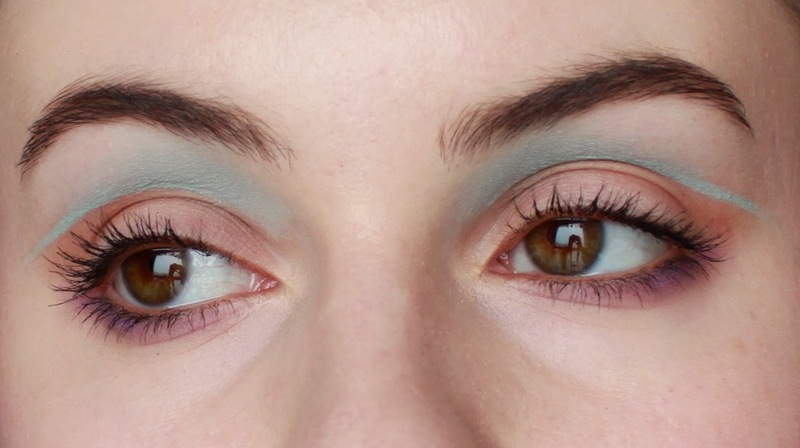 I like that this look turned into a kind of modern 60's flower child look, incorporating the springy colors that make me think of the 60's, but with the lighter color in the crease instead of a black or brown. If you'd like to try this yourself, I'd encourage you to find a blue that matches the value of your skin; meaning that if your skin is darker than mine, you might want to try a more sky or royal blue. I say this because it was pretty easy blending this pastel blue into my skin because I'm so fair, but a pastel like Clearwater might not blend as easily into a darker skin tone. Thanks for reading, and apologies for my highly casual hairstyle! Enjoy your week!